Olympia Books is no longer in operation according to reports, but it is said to have a ghost named Mr. Bock. His name comes from lettering stenciled in the hallway that leads to the apartment upstairs. The ghost has been known to knock books off of shelves or place them in front of the door. He has also twice set a chair in front of the door, facing out toward the street. His footsteps and disembodied voices have been heard and lights come on and off by themselves inside Mr. Bock’s apartment, say its current residents. 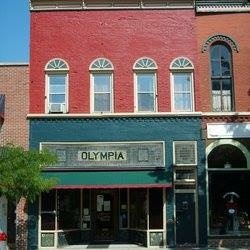 I am the owner of the Olympia bookstore and the building where it is located. It is back in operation now. I have not, however, had any paranormal experiences since taking over. It is very possible that the spirit or spirits who inhabited the store and building have moved on. A ghost hunter and someone who professed to be “sensitive” to them, however, walked through the bookstore and the basement and said that he definitely fea lt a presence still there.